As you, my lovely readers and friends, are finding out, I have been a bit busy lately with a new endeavor called Mom It Forward. Some of you may be wondering what the heck this Mom It Forward thing is and why it would have so wholeheartedly caputred my heart and subsequently, my focus! Mom It Forward is the newest trend in mom groups and makes giving back fun, sociable, accessible, and stylish—the new “in crowd” of moms where "mom" is a verb. IT RAWKS!!! Not only is it fun, has the benefit of forming new friendships, but it is all for a good cause. With its unique niche, the Mom It Forward community is the perfect mommy gathering place or group—both online and in real life—to talk about something moms have in common—our passion for making a difference. Members of the Mom It Forward community join for strength and friendship—you know, the adult interaction all of us moms are craving—but leave with so much more... feeling strengthened, uplifted, excited, and with ideas for and a call to action to give back in fun, creative, meaningful ways all while balancing their role as a mom. One of the many benefits of being a part of this group has been the benefit of meeting such great people and serving alongside them and on some occasions, serving together with our families. Attending the Blissdom Conference and subsequent Mom It Forward service project was one of those opportunities. The most amazing part of Blissdom was seeing the old addage "all's well that ends well" taken to new heights with "all's extraordinary that ends extraordinarily." I am referring to the Mom It Forward service project at the Nashville Rescue Mission sponsored by Scanpan (who donated 5 sets of high-end cookware to the Mission, nearly making me wish that was my kitchen—the pots and pans were AMAZING). Influence and reach is more important than numbers! We learned at the conference that blogging traffic is not as important as reach and influence. We experienced the same concept in a different way at the Nashville Rescue Mission. Our team was small in numbers—7 to be exact (Carissa, Kim, Josh and Rebecca, Ghennipher, Marie, and moi). 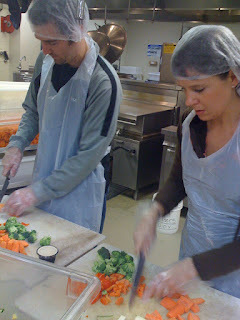 But we helped prepare lunch for upwards of 1500 people. Now that is reach! Shared meaninful experiences builds community. As we Mommed It Forward, our team experienced one of the most vital parts of building community: shared meaningful experiences. We may have been chopping vegetables or mixing in dressing on salads—ordinary tasks done daily for a mommy. But these ordinary tasks became extraordinary when we performed them while working together for a common goal and great cause—to help those who truly were not able to help themselves. It was an amazingly humble experience! Stepping forward and out of your comfort zone is key to Momming It Forward. We got out of our comfort zones. Not only did we Mom It Forward in terms of serving, but we took a step forward from an area in which we may not have been entirely comfortable—from our comfort zones, helping us all to embrace a very important step to Mom It Forward—taking action! Partnering makes Mom It Forward possible. This entire experience would not have been possible without a lot of creative connections. 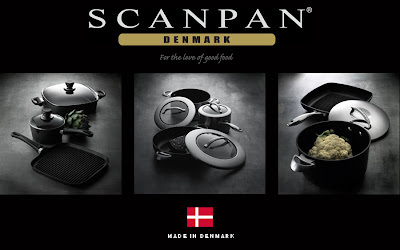 Specifically... the wonderful people behind the Blissdom Conference, who brought all of us together; the amazing Nashville Rescue Mission organization; our small, but influential team of Mom It Forward moms and dad who sacrificed sleep or fought headaches/sickness to participate; Nancy Martira, the lovely and brilliant PR professional and now friend, who introduced us to Scanpan; Scanpan for their generous donation and sponsorship (you've got to check out their cookware... as Alli Worthington of Blissfully Domestic says, "It's Lickable! "; Jessica Smith for introducing us to Nancy Martira; Abdul (I wish he had a blog I could link you to) for being our amazing taxi cab driver (no! he's no relation to Paula. I asked! LOL! ); and most importantly, the people at the Nashville Rescue Mission—for their strength and goodness, however limited or ill understood. The Mom It Forward mission is alive and kickin'. We have heard a few times that the Mom It Forward mission to "change the world one mom at a time" is lofty. What the Nashville Rescue Mission experience taught me is that it is possible. Mom It Forward can accomplish this mission one day at a time, one person at a time, one location at a time. We already are, including the partner that sponsored the opportunity, the organization that made it possible, the team members that provided the service, and the amazing people who received it. If you'd like to learn more about Mom It Forward or get involved, please visit our Mom It Forward blog. If you have questions or partnering ideas, please e-mail us at momitforward [at] gmail [dot] com. It looks like everyone got a lot out of helping out. The saying you feel better when you give is so true. You girls have such big hearts! I wish I could have been there with you! Mom It Forward will be a household name someday. Thanks for letting us join you on this project. 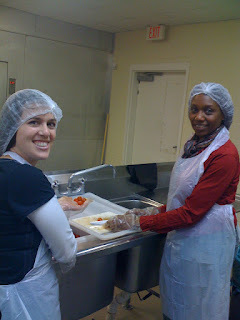 Rebecca and I enjoyed getting to know everybody and also serving together with you. Wow, the project looks fun and meaningful. I've not heard of the Mom It Forward movement before...learn something new everyday! It does sound like an awesome way to meet people and have fun doing something worthwhile in the process. HI Jyl!!!! Wow! Sounds like you all had a blast at Blissdom! Looks like you Momed it Forward to by helping feed lots of people! THat's WONDERFUL! So sorry I missed it. I'm considering BlogHer, but need to figure out my daughters summer plans (vacation, camps, activities, etc.) before I commit. To take full benefits of your niche, you can try a research tool that I recommend and it can help you earn and save a lot of your resources and decreases you research time on the internet. I'm the sort of guy who loves to seek unused stuff. Right now I am constructing my hold solar panels. I am managing it all alone without the assistance of my staff. I am utilizing the net as the only way to acheive that. I ran across a very amazing website which explains how to contruct photovoltaic panels and so on. The web site explains all the steps required to constructing solar panels. I'm not sure bout how correct the info given there is. If some people over here who have xp with these works can have a see and give your feedback in the site it will be awesome and I'd highly treasure it, cauze I truly like solar panel construction.